A recent survey by the British Election Study found that 62% of 18-25 year olds voted Labour at the general election, compared with just 18% voting for their main rivals, the Conservatives. In this article I will analyse the reasons behind these staggering statistics, and highlight the issues it could cause the Tory party in the future. After Jeremy Corbyn's success in the election, it's fair to say that the Blairites “New” Labour is dead in the water (for now). In comes a new, yet “Old” approach from the Labour Party, which I'm calling “Old Labour” for the purpose of this article, (as Corbyn's Labour is traditional to the parties historic beliefs). In spite of Corbyn gaining 34 seats, (coming well short of a majority). No one can deny that through his ardent campaigning and captivating rallies, Labour's team have managed to mesmerise voters, promising them the world and taking them back to the 1970's (a time many of his supporters cannot remember). His hard line socialistic politics are gaining popularity, which is very concerning for his opposition. But how exactly did Corbyn and his radically left ideology, persuade thousands of disengaged people to vote for him on June the 8th? There are many similarities between Labours 2017 manifesto and its 1983 manifesto dubbed “The longest suicide note in history”. The manifesto included a call for Britain to encourage worldwide nuclear disarmament by scrapping our own nuclear weapons, Corbyn failed to say he would use our nuclear deterrents, and is in favour of disarmament. Another pledge was to increase the governments powers over banks, similarly Corbyn wants to set up a national investment bank. The two manifestos are extremely similar, but why has Corbyn's manifesto been so much more successful? 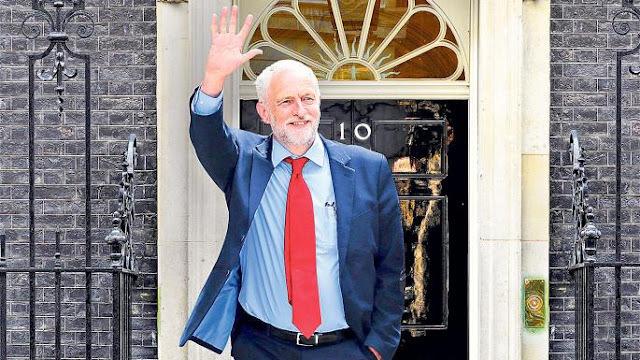 After years of cuts under the Conservatives the Labour leader offered a new type of politics, “The politics of hope”, it instantly connected with the electorate and lifted their spirits. However if Corbyn ever got into power his voters would only find out that is was false hope promised, his elaborate borrowing and taxation increases would cripple even our great nation's finances. The Leader Of The Opposition often claimed “We have had enough of austerity”. What Mr Corbyn doesn't realise is that austerity isn't a choice. It is the way we have to unfortunately dig ourselves out of the hole that the 2008 financial crisis created, exacerbated by the imprudent control of the last Labour government. The Conservatives have been accused of being “selfish in government”, but surely paying off our debt so that the future generations don't have the same burden is actually selfless? Cunningly, Corbyn identified the huge amount of wasted votes he could potentially acquire if the youth turned out. If Labour had won the election, the scrapping of university fees may have been the best bribe in political history. However, he failed to do so even though his opposition was running its worse campaign in 50 years. Proving once again that he is fantastic campaigner, but unelectable to the remainder of voting public. Corbyn's plans of abolishing tuition fees certainly worked amongst the young, it motivated students to get to the polling stations and express their democratic will, many for the first time. They cleverly used their dual residency ability to make their vote count in key marginal seats, in an attempt to propel Corbyn into number 10. But with a national debt of £1.9 trillion, can the youth really believe what Corbyn claims? Raising taxation for the highest 95% of earners and increasing corporation tax would never be enough to pay for Labour's radical policies. The bleak reality is that the taxation cost required to fund his hard left policies would eventually fall on the general public. The Conservatives strict austerity policies are unpopular, but they have managed to reduce the deficit by two thirds since 2010, created 3 million jobs, increased the minimum wage and introduced the living wage. Not forgetting the latest employment statistics released, 74.9% of 16-64 year olds are employed and unemployment is down to 1.49 million. They've turned around an economy from near bankruptcy after Liam Byrne, chief secretary to the treasury under Gordon Brown wrote a note saying “I'm afraid there is no money”. The UK has the 5th largest economy in the world, a country based on capitalism, (a far from perfect system) but still the most successful economic system for creating wealth, billions of jobs and reducing poverty. A Socialistic Britain under Corbyn would never flourish. It promises equality, wealth and safety for all, but is proven to only provide poverty, tyranny and hardship for everyone. Many socialist countries around the world are failing. The examples of socialism gone wrong aren't merely historical, Greece, Cuba and the once rich Venezuela, are all failed socialist states that are now ridden with mass unemployment, poverty and corruption. Corbyn has previously praised Chavez's Venezuela. But unfortunately Labours new young voters fail to understand this. Under Corbyn, borrowing would surge while he searches for his imaginary “magic money tree”. It is easy to make quixotic promises while he isn't in government and can't deliver them. From the outside looking in he may truly believe we can afford it. But if he ever got into number 10 he would soon understand the bitter truth. Corbyn's control of social media was masterful during the campaign. Targeting young voters on Twitter, Facebook and Snapchat really meant that there was no avoiding his message. He also got singers and actors involved with the campaign. They preached his ideology and persuaded voters to join them. They made it appear "Cool" to vote Labour. His “Bernie Sanders” like rallies also helped his popularity, showing he was not afraid of the public and enjoyed the social aspect of campaigning. The rallies were in stark contrast to his opposite number, Theresa May shied away from the public eye and relied upon robotic phrases. Whenever she made a rare media appearance, she failed to make a connection with voters. I praise Corbyn's performance in the election, he campaigned passionately and spoke powerfully. The leader of the opposition showed his charisma and humour, proving he was a human being unlike his Tory counterpart. He has a remarkable ability to connect with the electorate, seeming like he isn't part of the Westminster bubble. But he failed to exploit the Tories abysmal campaign, and weak leadership. He failed to capitalise on the Conservatives self destruction. Since the election his doubters have temporarily disappeared, on the surface Labour seems a harmonious party, but scratch below and it is still disjointed. His doubters will pounce when he falls, with his downfall will go the hard left politics in Labour. Labours leader is a honest and principled man, however his politics are worrying for this countries future. Recent opinion polls suggest that Corbyn is in-fact ahead of Theresa may and would win a majority if there was a general election tomorrow. Opinion polls are notoriously inaccurate, but if they are anything to go by then the Conservatives should be getting nervous for 2022. The Labour campaign on the whole was unsuccessful, they lost the election. But the 25 year high youth turn out they managed to trigger was a great success. Corbyn's popularity amongst the youth should be carefully learned from. After Theresa May called the snap election, 1.05 million young people aged between 18 and 25 registered to vote. The new young electorate have the potential to cast a huge amount of votes, for whichever party that inspires them. Which is why it's worrying for the Conservatives, who have turned a blind eye to the youth as historically, many didn't vote. But now, unless they develop engaging policies for the young, they risk losing the next election if they can't get the youth on board. In order for the Conservatives to persuade the 63% of 18-25 year olds who voted for Labour, they must launch a unique campaign in the next General election. With areas dedicated to policies that will really help the young, offering them some real hope.